Stone Soup Farm Co-op founders Jarrett Man, from left, Susanna Harro, Amanda Barnett and David DiLorenzo Tuesday at their farm in Hadley. HADLEY — Most farmers will tell you that cooperation is crucial to keeping a farm running like a well-oiled threshing machine. 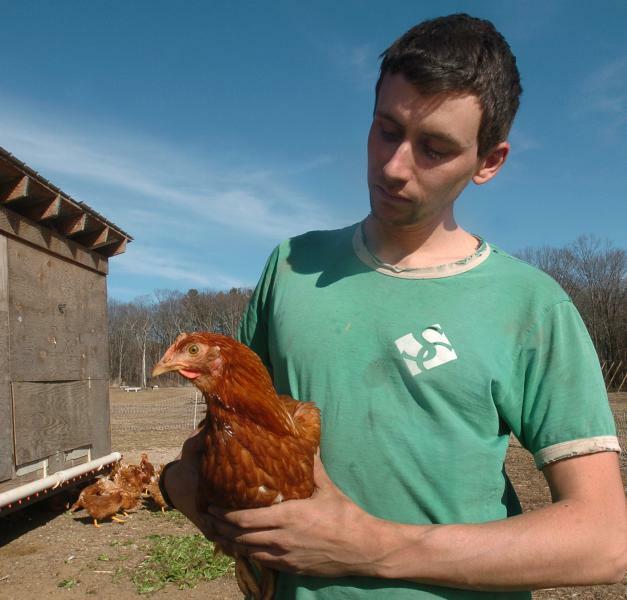 But at Stone Soup Farm Cooperative in Hadley, cooperation is everything. Four young farmers formed the worker-owned farm collective last fall and they have been working together to grow greenhouse vegetables and raise chickens since. Susanna Harro, 24, David DiLorenzo, 26, Amanda Barnett, 29, and Jarrett Man, 30, are owners as well as employees at the 81 Rocky Hill Road co-op. Stone Soup Farm Cooperative is probably the first worker-owned farm co-op in the state, said Lynda Brushett, of the Shelburne Falls-based Cooperative Development Institute, who advises people in the agricultural, fisheries and food industries on starting cooperatives. “It’s a beautiful model. You need more than one person to run a vegetable farm,” she said. They decided to start the co-op for numerous reasons, including the lure of owning instead of just working on a farm and the dream of forming an equitable business with good friends. After five years of working and managing area farms, Man bought the Rocky Hill Road farmland and started working it three years ago. He said the communal nature of farming is what drew him to it in the first place, and a co-op reinforces those values. He approached DiLorenzo and Barnett, who are married, and Harro last summer with the co-op idea. “I thought it would be a more meaningful way of farming, and these are the people I felt best about farming with,” he said. “So I went to them and invited them to come research and implement a co-op together.” The group officially organized as a co-op in November and is selling community supported agriculture, or CSA, shares for the summer. There have historically been many co-ops in the agricultural industry, mostly those made up of member farms that join forces to better market and sell their products — think Cabot Creamery or the Pioneer Valley Growers Association. 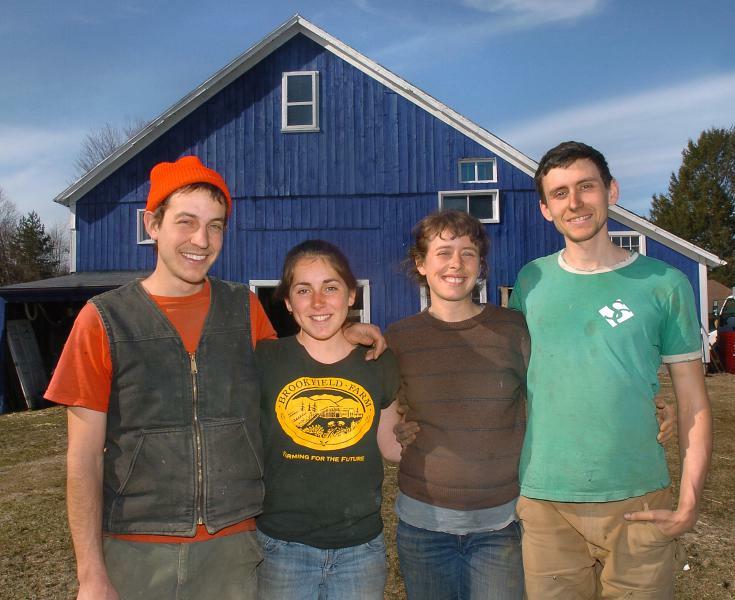 Brushett expects that more and more farmers, especially young ones, will be following the lead of Stone Soup and the few other worker-owned farms in Vermont, California and Quebec. Brushett is helping them get started. She worked with lead author Faith Gilbert to create a free guide to cooperative farming. It was downloaded over 1,000 times in the first two weeks after it was released Feb. 26 on TheGreenhorns.net, a nonprofit that supports young farmers. All kinds of co-ops are on the rise now, Brushett said. The Cooperative Development Institute fields several calls per week from people interested in starting market and cafe co-ops, child care co-ops, arts co-ops and others. She credited the trend to a growing interest in socially responsible business ownership and workers’ urge to be “more than just a cog” in a company. And when people have a stake in the business, they often make better workers, Brushett said. “They’re invested and everyone’s equal. You have colleagues you can trust to close the gate before they leave for the day,” she said. That’s how it is at the Hadley farm cooperative, DiLorenzo said — and why the four friends chose the name Stone Soup Farm, which Man had used for his previous farm business. In the folk story “Stone Soup,” a stranger with nothing comes to a town and pretends to make soup from just water and a stone, and convinces residents to contribute vegetables and other ingredients until it is a real soup. “We’re each bringing a little piece to this,” DiLorenzo said. The foursome started working together to build their co-op last summer, while simultaneously working out the formal structure of the co-op. They started an LLC, established an official path to membership for future worker-owners, and made the co-op the owner of equipment. DiLorenzo said the co-op model and Man sharing his farmland has made it possible for himself, Barnett and Harro to own a farm. “The three of us wouldn’t be owners without this, and it’s allowed us to pool our resources and talent to make this possible,” he said. They come from different places and backgrounds, but all their stories share a common thread: none of them studied agriculture at college, but started toiling on farms after graduation and fell in love with working the land. Man, from central Massachusetts, came to the area to attend Hampshire College. He worked on several farms before buying the Rocky Hill Road property and starting his own small farm. Barnett, from Sharon, said she was always interested in agriculture because her mother grew up on a farm. She met DiLorenzo, a University of Massaschusetts Amherst graduate from New Hampshire, while the two worked at local farms. He apprenticed at the Kitchen Garden Farm in Sunderland. Of course, owning a farm is not all upside. “We’re sharing the benefits of the work and also the stress of owning a business,” Barnett said. They have divided up management responsibilities and had countless meetings to make decisions collectively. “At all times, you’re trying to strike a balance between the efficiency of one person just making a decision and having a group decision with input from everyone,” DiLorenzo said. Each person manages a specific part of the farm. Barnett is in charge of the harvest and what gets included in the CSA shares, as well as some aspects of crop production such as irrigation. DiLorenzo does the bookkeeping, office work, and creates daily and weekly plans to make sure production is on track. Harro oversees the greenhouse production and seeding, and Man takes care of the chickens, maintains the equipment and oversees the apprentices. The four worker-owners, who all live in Hadley, receive equal monthly stipends as pay and if there are any profits at the end of the year, they will get dividends. They declined to say how much their stipends are. Over the winter and spring, they produced vegetables for 170 CSA shares, plus eggs for people who want them. 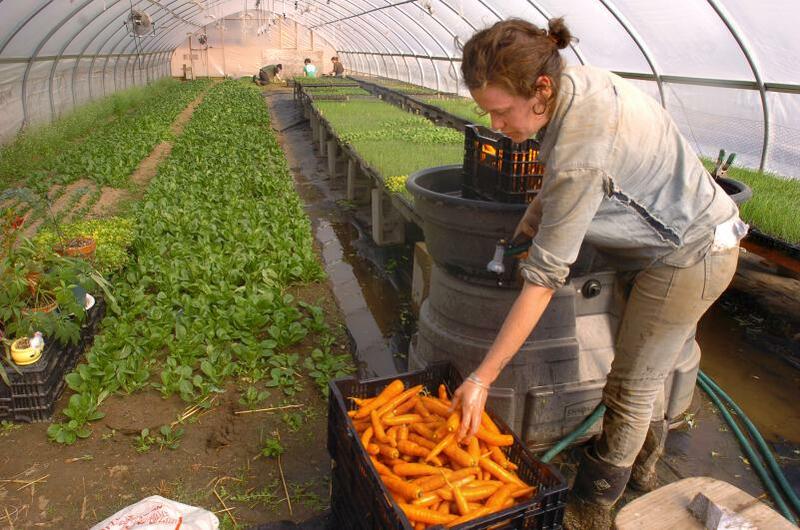 The cold spring has delayed planting about two weeks, Man said, but they are now plowing the 15 acres that they farm around Hadley and starting plants in their greenhouses in preparation for their summer CSA. They offer CSAs in Hadley, Amherst, Northampton and Boston, but do not have any plans to sell at farmers markets. They aim to sell between 300 and 400 CSA shares for the summer season. “We go well beyond what’s required to be certified organic,” DiLorenzo said. They try to avoid spraying at all, he said, even organic sprays. The farm usually has three paid apprentices, Man said, and they make up a big part of the farm’s work force and identity. While they imagine future apprentices could become member-owners as well, Man said the current scale of the farm cannot support more owners now. For more information, visit http://www.stonesoupfarmcoop.com. Previous PostUMass Student Farm kicks off seasonNext PostMore women in sustainable farming these days!